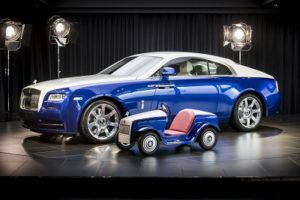 Luxury car brand Rolls Royce took a break from tradition and released its smallest and most novel electric model ever in the SRH. Designed especially for the Pediatric Day Surgery Unit of St. Richard’s Hospital – which is located in the marque’s hometown of West Sussex, England – the Rolls Royce SRH will allow the children awaiting surgery to drive themselves to the operating room through corridors lined with mocked up traffic signs. The idea is to let the children have fun before the surgery, thus reducing patient stress. Meanwhile, at the home of Rolls Royce in Goodwood, also in West Sussex, the company welcome two of the children scheduled for operation, Hari Rajyaguru and Molly Matthews, along with their families for a rare tour of the Rolls Royce production line. This is on top of the VIP treatment given to the children and their families. The company definitely held nothing back in giving the children the best experience possible. With the release of the SRH, Rolls Royce is expressing pride in being a member of the community in the West Sussex region, and is doing it’s best to help out. The company had taken notice of how important the work being done at St. Richard’s Hospital is, particularly at its Pediatric Unit, in providing essential care to young patients and their families, and decided that the Rolls Royce SRH would be a great way to alleviate child patient stress. An electric car built from the ground up by the Bespoke Manufacturing team, the Rolls Royce SRH comes in a two-tone finish, consisting of Andalucian White and Salamanca Blue, with a beautiful, hand-applied St. James Red coachline. It comes equipped with a 24-volt gel battery that allows it to move as quietly as the V12 engines that the Rolls Royce Motor Company has become famous for. The Western Sussex Hospitals NHS Foundation Trust, headed by Chief Executive Marianne Griffiths, also expressed gratitude for the joy that the Rolls Royce SRH brought to the children and their parents. The car is one of if not the most incredible donations received by Love Your Hospital, the trust’s dedicated charity. The trust further thanked the team of volunteers who gave their time to help out at St. Richard’s Hospital.